Third of the Girl Who books, The Girl Who Soared Over Fairyland and Cut the Moon in Two by Catherynne M. Valente is a beautiful sequel in a beautiful series though, admittedly, is not quite the strongest of the bunch. Though it has some of the most touching and emotional scenes so far, it also has a bit of trouble staying within the story. Sometimes it briefly lost my attention as Valente also seemed to get a little lost in her own flowery prose and turned away from the characters. Still, even the least-perfect entry in this series is a book well worth reading and sharing (and thankfully sets the scene for book four!). And so September tried to put an expression of a very proud, noble, solemn adultish sort of wonder on her face, because it was a trick she felt she ought to learn. But that is a lot to contain in two eyes, a nose, and a mouth, and she really only managed her own unhidable leaping, fizzing joy--yet this time the joy was a silent one. It jangled inside her but did not boil over. To be back in Fairyland. To be near magic and thrillingness again. To be in a place where she did not have to lie about the things she wanted most of all--because they were here, and she could touch them and talk with them and wrestle with them and ride upon them. 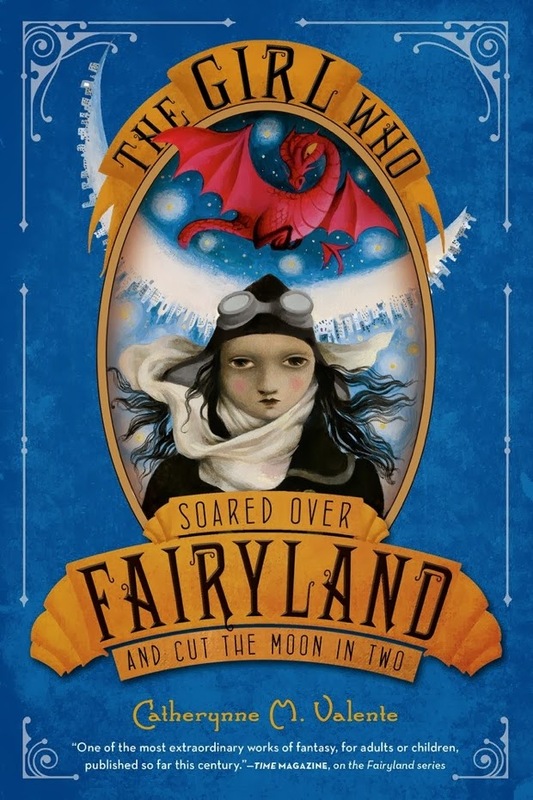 If you haven't started this series yet (with The Girl Who Circumnavigated Fairyland in a Ship of Her Own Making), you're missing out on a truly wonderful story. There is a novella from 2011 on Tor.com, The Girl Who Ruled Fairyland -- For a Little While, which is set in the past of this world -- if you need to take this tale for a test drive. I know, I know. I'm going to start it soon. I promise! Oh, what a bummer that this one isn't as strong as the last two. I admit I liked the first one better than the second one, too, so if this is not as good as the second, then it may be quite disappointing! Might be one for the library, then, and not a purchase. I actually liked the second better than the first. I would have to do rereads to see if I still feel that way. Maybe this summer I will read all three again. It might just have been a little harder for me to get back into the world this time. I have only read the first book. I really need to get around to the others. Definitely! I wonder how many there are going to be eventually. I really need to get to this series sometime!! Valente DOES get lost in her beautiful prose! I think she's swell in many ways, but I think she'd also benefit by having a few weeks with a very mean editor who sneers at her lushest sentences. Yes. They're such gorgeous sentences that it's painful to say that but it's true. I have the first book in this series (even signed by the author) sitting on my shelf. I am determined to get to this series this year!! You absolutely need to! It's such a quick but rich read. Put it on your list for the spring! That's always a super fun thing to do and this would definitely be a good series for it!